In the last few weeks, I’ve been to Fogo, Twillingate, Morton’s Habour (well I passed the sign anyway). Gros Morne was in the mix as well. So I don’t know how fair it is to really write a Caddyshack Gander blog about places outside Gander. But honestly, sometimes you just need to be by rugged cliffs and the salt air. Gander Lake can only provide the one. But Gander is a good base. I guess that’s why the whole town started in the first place. Safe for enemy intrusion; great for refueling aircraft before heading overseas – this town had it all. But seriously, we loves ya Gander. We do. 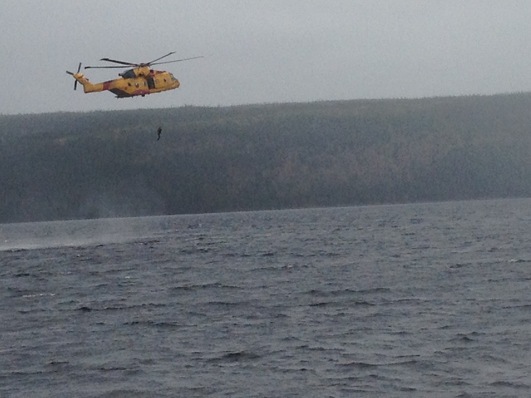 SAR tech jumps from Cormorant helicopter in a practice drill at Little Harbour. Where else could you drive out to a lake with several great spots to have a fire, a chat, launch a canoe and maybe even a swing within 15 minutes from your front step? Ok, lots of places in Newfoundland you say. But do those places also see Search and Rescue 103 doing practice drills with the Cormorant out by their favorite hang? I don’t think so. But that’s just what happened the other week when down at Little Harbour. The chopper came flying over the hillsides, hovering over the lake right in front of us. It was a bit cold and windy that day, perhaps a good day to practice difficult rescue situations. And sure enough, the helicopter went closer to the water, someone jumped out. And then someone else. It’s was really cool to watch that and think, ‘I wonder if I know who’s there?’. What an amazing thing they do for a living. And I mean amazing in its truest sense of the definition. Oh, and a trivia update. Me and Jill are currently the reining champions for the third week in a row. It’s been a bit of luck and a lot of having the right friends join us at the appropriate nights for certain categories. Thanks guys, we couldn’t have done it without ya. Drinks on us! It was just like any other night they found the bead. “I found the bead” I exclaimed with excitement as I removed it from the hot tub water and shoved it in my friend Jimmy’s face so he could see the bead that he has seen a million times before. There’s something about finding the bead that makes you feel like you’ve never seen the bead before. Its quite the game. I believe it started in 2010. It’s a bead that precariously floats in our favorite hot tub. It belonged to a bikini, but fell off one night (one good night) and has since become “The Bead”. Those that know pay homage. I’m not sure if it’s the beer, the company, or the timing of how the two come together, but I am super productive when in the hot tub. I’ve helped people through relationship issues, career changes, Fantasy Sports strategies, home reno’s. You name it. It’s been solved or created in the tub. But NOTHING beats the idea we had last night….. We’ll save that for another time. Tomorrow is a HUGE day. The Gander Golf Club opens and I am totally pumped. The forecast is looking terrible, but that will not stop me tomorrow. If I freeze on the course I will be completing 18 holes no matter what. Its also Friday of the May 2-4 weekend, a NL tradition that exists all across Canada but people here like to think we invented it, or at least mastered it. Certainly there will be some get togethers / parties to rival on our beautiful island east of the Gulf but our weather will not make anyone envious. I actually heard the word snow. Wow. How unique are we? Really? (that’s positive, right?). My plans for the weekend? Stay dry. No seriously, stay dry. I am in a fun little Fitness Challenge over the next 8 weeks and you get bonus points for staying sober. The Mission: Get in great shape this summer and keep the late night, calorie stacking, carb loading, terrible morning creating nights to a minimum. There will be some ‘times’ for sure. But the more day light I see this summer, the better. The prize: Too sweet to tell you. But trust me, it will be worth it ;). My goal: besides beating my challenger, run the Tely 10 in less than 70 mins and have as many productive weekends as possible. It’s all about positive procreation son ! That’s why I am here man. So the blog, activities, and idea creating are all happening at different speeds. We’ve heard some people say “I’ll add to the blog” all are welcome of course. The network of fun times, sharing, and producing has begun. The outlook: Positive. Fitness Challenge Total: 2 points. It’s already May 14… Caddyshack Gander isn’t off to a great start in cyber world, but it’s one heck of a time in the real world! The weather has been great so far. Three 20 degree days already. 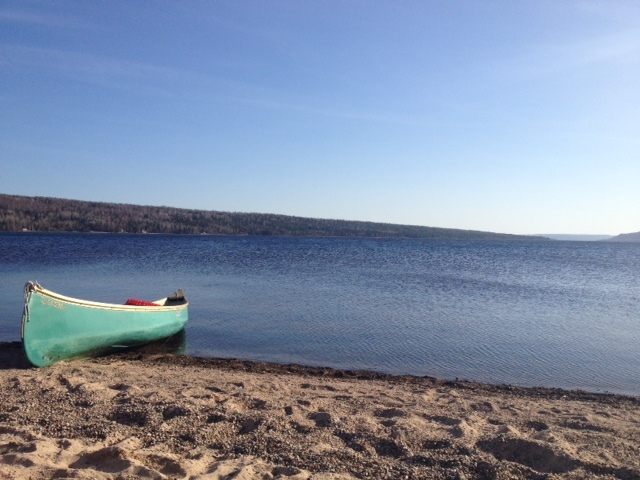 A few Sundays back, it was even nice enough to go for a canoe ride on Gambo Pond. My time in a canoe, too! But Caddyshack isn’t all outdoors. Trivia at Beeches in the Gander International Airport is the new thing to do in town. Tuesday night at 7pm. Come and bring your brains. For two weeks in a row, my team has come second place. I got a little cocky last time, but got killed in the Survivor category. I did, however, nail the famous Newfoundlanders one. And Lindsay gave us top score with world famous landmarks. Tonight is round three and I hope to walk away with the top prize. Wish me luck. Oh, soccer is back on the go in Gander too. I’ve only gone to one scrimmage so far, but a few of the crew say they are interested. It just happens to fall on the same night of Zumba… and a girl has her commitments. But when the real hot temperatures come around, I don’t think I will want to be jumping around in a gymnasium with 80 other women and no air conditioning. Give me the fresh air, thank you. And swimming down Denny’s Pit 🙂 But that’s a few months away yet. It’s coming up for the May 2-4 weekend and that means it’s gonna be cold, wet and deary – the ideal Newfoundland camping weather. I’m pretty sure I read there were flurries in the forecast too. I haven’t nailed down my long weekend plans, but I’m pretty sure it will be a trip up to Norris Point for Trails, Tales and Tunes. Sherman Downey and the Ambiguous Case are playing and I have yet to see them since they won CBC’s Searchlight contest. Should be a time. Yea, yea, that’s not Gander. But sometimes you just need to drive to Gros Morne, amirite? Of course I am. “Write what down?”, she asked somewhat puzzled. I was telling a new friend about a blog my friend Mel and I were talking about earlier that week. Her very simple question was a polite, casual response one would instinctively ask when hearing of a ‘new blog’ or writing idea. My reaction was not just a blank stare, it was a stare of a speechless deep thought. The kind of deep thought that causes my left eye (which is lazy, and is nicknamed ‘Winky”) to drift in the upper corner of my socket. “I don’t know, just anything.. I mean, its obvious isn’t it?”. Though my answer was broad, I had the answer in my mind somewhere and I felt comfortable with that. Surely you’ve had ideas in your mind that you weren’t ready to explain to another person yet, but to you it made perfect sense? Its the same kind of rationale an out of shape person makes when they order their 3rd super donair of the week with a diet pepsi instead of a regular one. Its called a “Break Through”, or something like that.. Actually, I’m not sure, so don’t quote me. So, why the idea? Why was it hard to explain? Well, the idea came from a couple of people who had high hopes for the summer. One an avid golfer that chose the Gander Golf Club as his number 1 reason for moving back to Gander. The other an up and coming professional who chose Gander to stay with her company and to gain valuable career experience. Both people enjoy big picture thinking, being positive, loving their fellow community member, making the best of any situation, socializing, being adventurous, trying new things, hearing of others experiences, and having a “Time”. Sooo.. why not diarize this summer of high hopes? No rules, or boundaries on topics, just peace, love, and good times like they back in the 60’s or 70’s. This is why it’s so hard to explain. There are no rules (besides the one’s outlined in Canada’s Charter of Rights and Freedoms) , write about anything, write about something, someone, an experience, a perspective. It’s all good. Write something to tell the world “Hey! We are here and loving it. Join us”. Moving back to Central NL is very exciting for me. Never have I made a personal or career move that every day makes me so grateful for where I am in life. This place is fricking Beautiful. The scenery, the people, the fresh air, the freedom, the opportunity. Its incredible. 5 years ago I would have never moved back to Central. (off and on I’ve lived in Gander for approx 10 years). But I was a different person then. People ask me “What’s it like being back in Gander?” My answer is simple: “If you are over the bar scene and chasing girls (or guys) till 4 in the morning. Gander is a great spot. BUT, if you want to ride the ‘single’ train chasing a hook up you will probably get bored and frustrated quickly.”. I decided in my late 20’s to be on the hunt for soul and substance in any of the relationships I have in my life. Central NL, the east coast, Canada as a whole, is a wonderful place to find those beautiful things, you just have to change your attitude/priorities. At least this is what has worked for me. So, much like the weather and road conditions still have one foot in winter and the other in spring, I find myself with one foot in the old me and one foot in the new me (whether that foot is in my mouth or not, we wait and see). Hence, the blog, the diary, the “how it went’ archives, The reason CaddyShack Gander was born. It’s late April in Gander. The snow is melting, you can wear your summer jacket and you can even drive your 2009 Vibe down Little Harbour without getting it stuck and having to be rescued by the volunteer fire department. Trust me, this is a huge improvement from just a week or two ago. Spring has sprung. And so has our blog. The recent warm temperatures had me craving a boil-up by the water the other night, so I assembled a crew and off we went to have supper by the fire. On the menu: Garlic Stuffed Roast with Roasted Potatoes and Orange Chocolate Cupcakes for dessert. Myself and Jo got most of the stuff ready at home; seasoning then double-wrapping the roast in tinfoil, chopping veggies, getting the plates and cups. Jasmine brought the taters. Prepping the food was one thing, prepping the fire was another. I needed the fire to burn for at least an hour, so we scavenged the area for the winter’s fallen trees. There were a lot of big ones (well to my tree eye – apparently NL trees are tiny) that could have been hauled through the woods. Tough stuff with bare hands. Thankfully Greg had a pickaxe. And his metal teepee grill came in handy too when it was time to cook, because as prepared as I was, I did forget the grill. And it was the best meal I have ever cooked outdoors, I gotta say. I think the seven person party would agree. And we weren’t the only party on the go at Little Harbour that evening. Off by one of the other beaches, you could hear dance music blaring. Naturally, that drew our curious minds straight into their fire. I came in late on the party crash and all I learned was that one of the dudes really didn’t like Quebec. Sure, Rick Astley’s ‘Never Gonna Give You Up’ is a great song, but it blasting from their truck was not enough to make me stay. 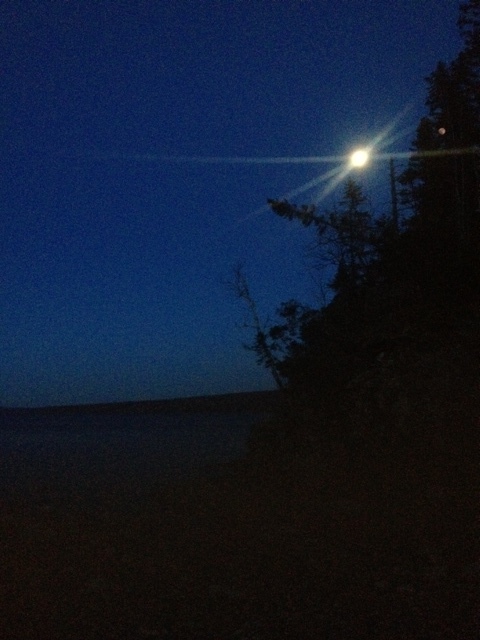 Back to our fire, where I took this fine picture of the moon. It was a nice, quite night spend with good friends – the perfect moment to begin Caddyshack 2013. It’s only the start of the sunshine and good weather… I can’t wait to see where the reason of the year will bring us.